resource center for information on birth injuries. Gestational diabetes is a temporary form of diabetes occurring during pregnancy in certain women. Gestational diabetes is a very common condition affecting 1 out of 10 pregnancies. The condition usually first occurs in the later stages of pregnancy and gestational diabetes can significantly increase the potential risk of a various birth injuries and other complications. Understanding this common pregnancy condition and how it is diagnosed and managed is therefore very important for all expecting mothers. Gestational diabetes is unique form of diabetes that occurs during pregnancy. Diabetes is a well-known condition that impairs the way the cells in your body normally use sugar (glucose). Anytime you eat food, some of it is processed into glucose that enters into the bloodstream. The hormone insulin, which is produced in the pancreas, acts to regulate the levels of glucose in the bloodstream. Insulin moves glucose out of the blood and into the cells of your body where it is converted into energy. During pregnancy, a woman's body starts to pump out very high levels of various other hormones, including human placental lactogen (hPL). The obvious purpose of these additional hormones is to facilitate fetal growth and health. However, as the levels of pregnancy hormones like hPL increase they gradually make the mother's body more and more resistant to insulin. Gestational diabetes develops in a certain subset of pregnant women whose hormones block the effect of insulin more than others. In these predisposed women, the hormones in their body eventually render their insulin entirely ineffective at processing glucose out of the blood and into the body. They become diabetic and suffer the effects of excessive blood sugar levels. Gestational diabetes is a relatively common condition. Recent data from the CDC estimates that gestational diabetes occurs in about 9% of all pregnancies. Screening for gestational diabetes is part of routine prenatal care. The condition is usually diagnosed in the later stages of pregnancy (after the 28th week). Preeclampsia: preeclampsia is high blood pressure during late pregnancy and labor. Preeclampsia is a common condition but if not managed properly can result in stroke, organ failure and other life threatening issues. Preeclampsia also greatly increases the chances of premature delivery which greatly increases the possibility of numerous birth injuries and other problems. Premature Birth: mismanaged cases of gestational diabetes often result in premature birth. Premature delivery greatly increases various health risks to babies including serious birth injuries. Fetal Macrosomia: fetal macrosomia occurs when babies become abnormally large (over 8.5 lbs.) before birth. Gestational diabetes triggers the baby's body to over produce insulin. The extra insulin causes the baby to gain more weight and it linked to fetal macrosomia. The general incidence rate for fetal macrosomia is around 9% but with gestational diabetes the macrosomia rate jumps all the way to 50%. This condition can make vaginal delivery risky and greatly increase the potential for birth injuries. Babies that are macrosomic are much more likely to get stuck in the birth canal during vaginal delivery. Hypoglycemia: gestational diabetes can also impact the health of a baby after they are born. Babies of mothers with gestational diabetes tend to overproduce insulin in their own bodies. This overproduction of insulin frequently triggers neonatal hypoglycemia - a condition in which blood sugar levels of the baby are dangerously low shortly after birth. Hypoglycemia in newborns can be dangerous and trigger certain types of seizures. All of these complications can and will make labor and delivery more difficult and increase the risk of a birth injury. Failure to timely diagnose and manage gestational diabetes can result in a number of other health conditions for your baby. These include, but are not limited to, jaundice, respiratory impairment, and congenital defects. Moreover, untreated gestational diabetes can result in blood sugar levels that are high enough to interfere with the functioning of the placenta and disrupt the delivery of oxygen and nutrients to the baby. This is why proper screening for gestational diabetes is a critical component of good prenatal care. Who is at Risk for Gestational Diabetes? Gestational diabetes occurs in about 9 out of every 100 pregnancies. Unfortunately, there is no way to determine in advance what mothers will get gestational diabetes. There are, however, are number of well-known factors that greatly increase the likelihood of gestational diabetes occurring. Age of Mother: studies have shown that mothers who are older than 25 at the time of pregnancy are more likely to get gestational diabetes. Obesity: mothers who are overweight when they get pregnant are much more likely to get gestational diabetes. Similarly, if you put on too much extra weight during pregnancy you will be at increased risk for gestational diabetes. 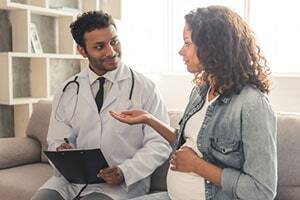 History of Diabetes: pregnant mother with diabetes or with some history of diabetes in their family are much more likely to develop gestational diabetes during a pregnancy because they are predisposed to insulin disruption. As long as gestational diabetes is timely diagnosed, it can almost always be managed very effectively. Management will start with more frequent prenatal care visits in which the doctor will carefully monitor blood sugar levels. Pregnant mothers diagnosed with gestational diabetes are also prescribed insulin to help process the glucose in their blood stream. Lifestyle and dietary adjustments are also used to manage the condition. Pregnancy mothers with gestational diabetes are advised to follow a pregnancy-safe, low impact exercise routine. Dietary management of gestational diabetes requires consumption of less fatty foods and more fruits, vegetables and high fiber foods.